Who Would Want to Kidnap Mohammed Dewji? 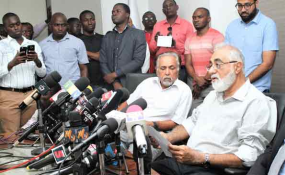 Dar es Salaam — Dressed in a white shirt, khaki trousers and black sandals, Gulamabbas Dewji was not in his usual element yesterday. Used to a busy environment supporting his family run a multi-million dollar business empire on a day-to-day basis, he has lately been thrown into an unfamiliar territory. The patriarch of the $1.5 billion (about Sh3.3 trillion) MeTL conglomerate (according to Forbes) is currently constrained at home, trying to come to terms with the unfolding nightmare of the abduction of his eldest son, Mohammed Dewji, popularly known as Mo. Mo, 43, was abducted by unidentified gunmen in the early morning of Thursday last week as he went for a workout at the high end Colosseum Hotel gym in Oyster Bay suburb. Police are yet to establish those behind Mo's abduction or their motive. So far, some 26 people have been arrested for questioning over the brazen attack which has shocked the country and attracted wide coverage internationally. Yesterday as he came out in public for the first time to speak about the abduction of his son, the elder Dewji looked physically exhausted and emotionally drained. His greying hair and beard were uncharacteristically unkempt as he shed off his sharp suits to walk into a packed press conference in light wear and sandals. He did not utter a word during the short press briefing. Instead, he sat and listened pensively as one who was in deep thought. He gestured and shook his head occasionally as a member of the family, Mr Azim Dewji, read out a passionate appeal to members of the public to help bring back Mo. It was in their statement that the family announced a record Sh1 billion reward to anyone who may provide information that would help find Mo. The hefty reward, according to Azim, was in addition to efforts underway by authorities, private organisations and individuals to provide whatever support they could to unravel the abduction, now in its sixth straight day. "We thank government authorities, the media and other institutions for the work they have done during this difficult time facing the family. Pray for us," said Azim in the brief statement. He assured that the information being sought would be treated with uttermost confidence. He said information should be sent to the family through the following mobile numbers: +255755030014; +255717208478 and +255783783228 or through email: findmo@metl.net. The announcement of the reward, the largest in the history of the country and also around the continent, signifies the turmoil or desperation that the family may be in. With no apparent clue as to whom they were looking for or when they may receive any uplifting news from the search teams, they have turned to the public for help. Mo has a wife and three young children. He is the second born in a family of five other siblings and is the CEO of MeTL which employs about 28,000 people across its operations in at least 11 African countries. In Tanzania, the company is said to employ thousands of workers and accounts for 3.5 per cent of GDP. Gulam Dewji founded the business in the 1970s and has since expanded under Mo to operate over 35 industries as diverse as trading, agriculture, manufacturing, energy and petroleum, financial services, mobile telephony, infrastructure and real estate, transport, logistics and distribution. Yesterday a somber mood was evident among staff at the MeTL head offices at Jubilee Towers in the city centre. Staff who ushered in journalists at the reception looked subdued while the usual chatter along the corridors of the 20th floor for those who have been there before was missing yesterday. It was a hectic time for hundreds of journalists who turned up for the event which has gripped the nation and occupied headlines since last week. The board room reserved for the announcement was fully packed, forcing organisers to lock out almost the same number inside. Meanwhile, Dar es Salaam Special Police Zone Commander Lazaro Mambosasa was quoted last evening saying that they were treating the abduction as the work of criminals looking for a ransom. He did not give the reasons for his suspicion but noted that the criminals' motive was not to harm the businessman as they would have done that at the scene of the abduction. He said those being held for questioning were largely security personnel and other workers at the Colosseum Hotel where the incident took place. He said they were among other things investigating why CCTV cameras did not work at that time. The public continues to pile pressure on authorities to provide answers and find the businessman through social media using the #BrickBackMo.